With one of my children deep into freshman year at a small liberal art college, and another in high school about to launch into the college application process, as well as a family therapist seeing families at this stage of life, I wonder whether this experience really has to be so difficult and pressured for our young people. How can we as parents help make this a positive learning experience rather than an ordeal to be endured? 1. Make sure they own the process. Choosing a college is the first major decision that our children make as young adults. How they make that decision is much more important than what college they go to, for it sets the stage for how they make many more important decisions – what career to pursue, whether or who to marry, whether or when to have children. Do they feel that only one choice will work, or else they are doomed? Do they feel a sense of confidence and optimism, or a sense of defeat? As parents we can help our children be reflective about their decision-making process, rather than forcefully expressing our own strong opinions or worries. 2. Help them choose a college that is a good fit for them. There are over 3000 colleges in the United States, many really good ones that you’ve never heard about. 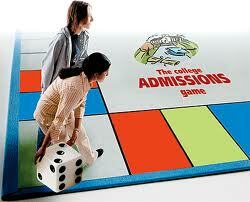 What’s most important is finding a school that will work for your particular child, academically and socially. If your child struggled in high school with their grades, there are schools with good learning centers and disability support services that could be a better fit than a school that is more known. Maybe your child loves the out doors, or wants to live in a big city, or wants to play in a steel drum band. All of these preferences can go into choosing a college, in addition to its academic reputation. Also, we can remind our children that no decision is forever, and that they can transfer to another school if the one they choose doesn’t work, or if they didn’t get into their first choice. 3. Help them expand their options. Improving their grades, test scores, extracurricular profile and essay-writing can be seen as ways of increasing their choices, rather than make or break hurdles. This can take some of the pressure off. In other words, we want our children to have as wide a range of choices as possible in terms of the schools that will accept them, but we also want to express confidence that they will find a school where they can succeed. 4. Expect them to have strong feelings. Applying for college means that our children are starting to envision an independent future. This is of course scary for even our most independent of children. They may need to push away strongly from us, and then at other times show a desire to stay close. As we help our children manage these choppy waters, we can make sure our own fears and sadness about them launching into adulthood, don’t get in the way. If we express fear that they won’t get into a good school, or that it will be hard for them to make friends, those fears will expand for them. However if we express confidence in our children and trust that they will rise to the occasion, than they will feel more confident in themselves. 5. Enjoy the adventure! Once we set aside our own notions that only one school or kind of school will work, the process of applying to college can be an exciting adventure to share with our children. We can visit schools and have fun traveling with them at the same time. We can help them expand their options creatively – maybe a gap year would work for your child, perhaps working at a service project in a developing country, before their freshman year, or getting a job to save money to attend a more expensive college. Jose, who was adopted from Guatemala, had a spotty high school record, and did not feel ready to attend a four year college, or to leave his family home.. He attended a local community college, did well, and transferred to a private liberal arts college near his home town. He came home frequently on weekends, and had trouble finding a major that fit his interests. He took a semester leave and got a job at an animal shelter. He then transferred to a large state university with a specialty in zoology, and is about to enter a graduate program to become a veterinarian. Once we find a way to chill our own fears and anxieties, we can help our children face the challenge of applying to school with a positive attitude and a healthy sense of excitement and adventure.